This page contains the musical fragments found on cuneiform tablets in Ugarit, stemming from about the mid-second millennium BC. They contained text (in Hurrian language) and musical scores of several "songs to the gods", all composed in the same tuning or mode (called nîd qabli). Only one piece, labeled h. 6, is almost complete. The interpretation of the notation is not clear, though several "reconstructions" have been published. It consists mainly of "dichords", whose interpretation in relative pitch is well understood from other sources, and of subsequent numerals. The meaning of these numerals (repeat counts or rhythmic values?) as well as the relationship between music and text remains unclear. Probably the vocal melody was known to the performers, while the scores provided rough hints at "intervallic harmonization". Although it is likely that one of the notes of each written interval regularly coincided with a vocal note, the latter cannot unambiguously be deduced from the former. The following abstract renditions provide the written intervals, while the numbers are represented as durations. 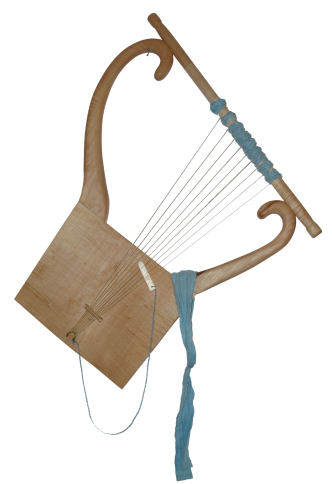 Since the 'scores' incorporate characteristics that are best explained on the basis of nine strings, and since the theoretical description of the ancient Near Eastern musical system is also based on a nine-stringed instrument, the nine notes of this instrument have been used: thus, the two highest pitches are always doubled one octave below. A sort of just tuning is used that can, with reasonable certainty, be deduced from the music. The "music" provided here can, perhaps, give an idea of the "harmonic" progression of the hymns, but is by no means intended to represent a reconstruction. Copyright notice: All rights reserved. You are not allowed to edit, publish, distribute, or sell the music files in this site or their music. You may, however, make local copies for private or academic use. E. Laroche, Textes Hourrites en cunéiformes syllabiques, Ugaritica 6 (1968), 462-496. M. Dietrich / O. Loretz, Kollationen zum Musiktext aus Ugarit, Ugarit-Forschungen 7 (1975), 521f. S. Hagel, Is nîd qabli Dorian? Tuning and modality in Greek and Hurrian music, Baghdader Mitteilungen 36 (2005), 287-348. Colored icons indicate pieces which are intact to an extent that allows to get an impression of the melody as a whole. These are MIDI files. The quality of the sound will depend on the MIDI capabilities of your sound card.